Twentieth Century Fox Home Entertainment recently sent us an advanced DVD copy of Dog Days, to be released on November 20th! As a fan of The Vampire Diaries I was stoked to see Nina Dobrev amongst the cast of this as well as This Is Us’s Ron Cephas Jones. The DVD does not contain much in the way of special features. Its Extras include previews for two films: Isle of Dogs, an animated feature directed by Wes Anderson and featuring the voice talents of both Bryan Cranston and Edward Norton, and The Miracle Season, the true story of the tragic death of the West High School girl’s volleyball captain and the team’s subsequent rise to stardom in her memory. 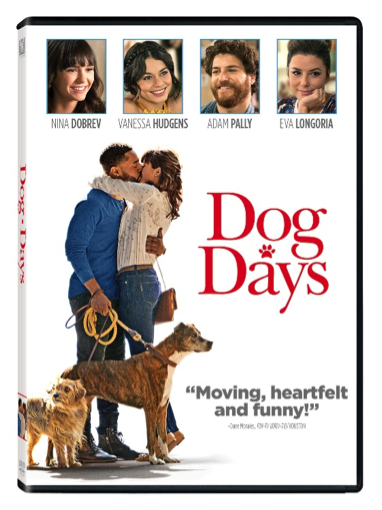 Dog Days is certainly nothing Oscar worthy but if you love dogs and are looking for a simply heartwarming flick to curl up to this holiday season, I can enthusiastically recommend it and the DVD would make a fantastic stocking stuffer for any animal lover as well.